A power drill is easily one of the necessities that anybody interested in home DIY projects must have. Be that as it may, it is important to select the right power drill so that the work can be completed faster, more efficiently and perfectly. The Black & Decker LDX120PK power drill is capable of being just that kind of tool for all kinds of projects at home. In fact, it is even good enough to use by professionals who need a power drill that they can rely on. Here are some of the features of this power drill. One of the first things about this power drill that uses will notice is that the tool is rather compact. As a result of this compactness, it becomes possible to manipulate this tool even in tight spaces. Users will be able to accomplish a greater range of tasks because of this feature. The lithium ion battery is one of the best features of the power drill. This batter is the power source of the tool. On the standby mode, the battery is efficient enough to hold the charge for nearly 18 months. Therefore, handymen can pick up the tool after days or even weeks and start working right away. There is no need to recharge the battery simply because it was not in use. 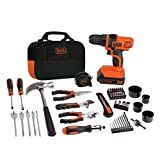 This feature is known as 20V MAX and it is a battery system developed by Black & Decker for a range of power tools. This system allows the battery to be used in a range of other tools such as power saws as long as they use the same platform. Since it is powered by a battery, the tool does not require any cords during its use. Cords are certainly a hassle. After all, they can complicate the operation. Therefore, the cordless design is a major advantage. Even if a power drill is going to be used inside a house, it should be capable of offering a high level of performance. The LDX120PK lives up to the expectations in this aspect easily. The motor is capable of producing a torque of 115 in-lbs. The drill has a speed range of 0 RPM to 650 RPM. The speed is good enough for accomplishing a variety of tasks around the home and even in professional grade projects. When using a power drill, there are two very common issues that crop up. Stripped screws make it rather difficult to remove them once inserted. Moreover, they cannot be used later. The other problem is that the screws may end up being overdriven into the surface. This can ruin the surface or the item being screwed. It is especially a problem for wooden surfaces as the wood may split or crack. This will not be a problem thanks to the 11 position clutch feature. It allows users to exert a greater control over the drill and thereby prevent such issues from happening. Using a power tool like a drill requires the user to control it properly. Otherwise, it can lead to a number of problems such as a ruined project. This will not be a problem with the LDX120PK due to its lightweight construction. Users get to enjoy an improved level of comfort. Apart from the greater control, it allows the drill to be used for longer without the weight becoming an issue for the user. This is another advantage. As expected from a reputed manufacturer like Black & Decker, this power tool is of a high quality. In order to show its confidence in the quality, the manufacturer has placed a good warranty on the product. The warranty lasts for 2 years. Portability is certainly one of the features of this tool. In order to enable users to truly enjoy the portability, a carrying bag has been provided. This bag provides adequate protection to the tool while it is being carried. At the same time, it provides a convenient way to store the tool when not in use. It is easy to see that a good amount of thought has gone into the creation of this power tool. The manufacturer has taken steps to understand the needs of the user and provided the features necessary in an affordable power drill.